Seven days after giving birth to her son, Kaleb, Summer passed out and was admitted to the emergency room. She was diagnosed with post-partum cardiomyopathy and was told she would eventually need a heart transplant. She was just 19 years old. The news was very terrifying, especially for a brand-new mom. A year and a half passed before she was in total heart failure. Summer was admitted to the hospital in October 2000. She was in a coma and did not wake up until the day after Christmas. Summer had to learn to walk and talk again since she had just spent months in a coma. She left the hospital in March 2001 with a left ventricular assist device, or LVAD. At the time, she was told that she was the first woman on the LVAD in her area. In May 2001, Summer went to Cleveland Clinic and was added to the transplant waiting list. Summer stayed at the clinic in an out-patient room, where she lived with others waiting for a transplant. Although the wait for “the call” was difficult, Summer said the hardest part was being away from her family, including her son, Kaleb, who was now two years old. Summer was fortunate to have Kaleb visit often, for a few days at a time. At the age of 21, Summer received her heart transplant on September 21, 2001. She received “the call” at 3 am. Summer knew her LVAD was failing and that she needed that heart to survive. A year and a half post-transplant, she wrote a letter to her donor’s family. Her donor’s mother responded to the letter. Summer had the opportunity to meet her donor’s family and has an amazing relationship with them. 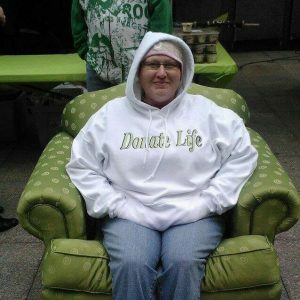 She feels that she has a special connection with her donor’s three daughters. Every year, they all take a trip together to their cabin. The trip is a celebration of her donor. Her journey started just a week after Kaleb was born. In May 2017, Summer saw him graduate high school. Summer and her husband were high school sweethearts. Her husband has stood by her every step of the way. “I would not have made it without my great support system,” Summer said. Summer was told she had a 5% chance of making it to her 21st birthday. She will soon be turning 40. Have a story to tell? Contact us. I grew up with Jodie and this is the sweetest thing I’ve read in a long time. God bless you and your family. What an awesome story!